What's included in the price you pay ANDES and what's not. This expedition is based in the Puna de Atacama of northern Chile. This is an area of the Andes we know well, having run many successful trips in the past twenty years, including many previous trips to Ojos del Salado from both the Chilean and Argentine sides, most recently in March 2016. The Puna de Atacama is a great area for seeing wildlife - on our 2011 trip we saw many condors, vicuñas, guanacos, an armadillo and even had a great view of a puma. The expedition will fly out to the provincial city of Copiapo via Santiago the capital city. After an initial acclimatisation phase of three days camping and walking at about 3500-4500m in the area known as Vallecitos we will begin our high altitude acclimatisation phase at the very scenic Laguna Verde base camp. During this phase we will probably climb at least one 5000m peak. There are small hot springs right by the campsite at Laguna Verde, and beautiful views to several 6000m+ summits. This main mountain trip will be a 12 night expedition away from civilization. After the acclimatisation phase we'll move on to climb Ojos del Salado. Firstly using a 4x4 to reach the Refugio Atacama base camp, then backpacking to reach the high camp on Ojos del Salado by a small hut at 5800m. From here the summit is a long day, perhaps as much as ten hours up, 3 or 4 hours down. Initially the route is on a good path, but higher up we'll encounter scree and blocky boulders. Finally there is a short chimney pitch of climbing just 30m below the summit. Most of the peaks in this part of the Andes involve no technical climbing however there is a short roped scramble just at the very summit of Ojos del Salado. There are also times when an ice-axe and crampons are necessary on the summit day of Ojos del Salado. This expedition are suitable for strong hillwalkers, although previous expedition camping or winter camping experience is preferred due to the demanding weather conditions. Please call or email if you have any questions about the suitability of this trip for you. The chimney pitch on Ojos del Salado just 30m below the summit. It is not very hard as far as rock climbs go.... but then it is at 6850m! Days 1-2 Flight via Santiago to Copiapo. Days 3-5 Camping and acclimatisation walks at Vallecitos. Days 8-10 Move to Atacama base camp. Days 14-15 Ojos del Salado summit day and spare day. The plateau of the Puna de Atacama lies on the border between Chile and Argentina and includes a huge area over 4000m above sea level. There are still many unclimbed peaks of over 5000m in this remote area. Many of the peaks in the area were climbed at the time of the Inca empire, when the mountains were worshipped as gods by the inhabitants and were frequently ascended in order to make sacrifices. The Puna is one of the most beautiful and haunting places in the Andes, compared by many to the high plateau of Tibet. The scenery is a bit desolate for some, but the huge open spaces, clear air and big blue skies leave a deep impression on everyone who visits this area. Copiapo is a small provincial capital at the foot of the Andes about 500m above sea level. It is the nearest access city with an airport for the Chilean side of the Puna de Atacama, and the place to buy permits for Ojos del Salado as well. Copiapo is a major mining centre in northern Chile, so we'll apologise in advance for there not being a great deal to see around town but at least you'll get a steak and a shower! Despite the fact that at first sight there is almost nothing to eat in the high barren plateau of the Puna de Atacama the area is very good for seeing some of South Americas unusual wildlife, particularly on the 4x4 drives into and out of the mountains. Vicuña and guanaco are wild relatives of the llama and are seen frequently. On the lagoons there are flamingos and other species of birds and on this trip we can pretty much guarantee to see a condor circling the peaks. 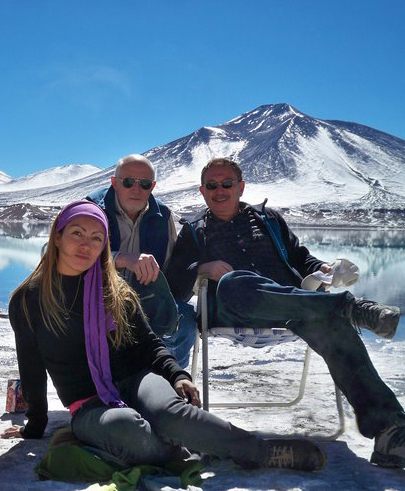 Relaxing at the Laguna Verde on the Chilean side of Ojos del Salado. Although there is not much difficult climbing involved in the ascents planned on this expedition, climbing to such heights is still a serious matter because of the lack of oxygen at high altitude. We will allow plenty of time for expedition members to acclimatise to the altitude but because of the nature of the expedition we recommend clients to have previous successful experience at altitudes of 5000m+. It may be necessary to use an ice-axe and crampons on summit day on Ojos del Salado, but previous experience of using these is not essential. Above base camp on the mountains we will be unsupported and therefore will have to carry expedition weight (20kg) rucksacks uphill for a day or so to establish high camps, so some recent experience of backpacking is essential. 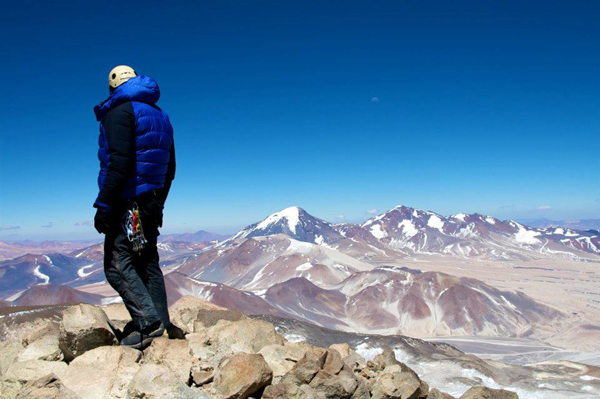 Looking out over Chile from the summit of Ojos del Salado, December 2011 "Andes" expedition. The climate at altitude in the Puna de Atacama is very cold and extremely dry. In the mountains temperatures can fall to minus 20ºC at night. During the day in the mountains it can feel very warm in the strong sun, but it can also be bitterly cold and windy. It should be dry all the time we are in South America, although there is a slight chance of a snow flurry in the mountains. As we are near the tropics come prepared for about 10 hours of darkness every night. Temperatures in the valleys around Copiapo and in other low lying areas will be a very pleasant 20-25ºC during the day. Our expeditions are designed to be small and flexible. The expedition will be co-ordinated, organised and lead by us, but we will consult and involve the expedition members when planning the details of the trip. Please note however that the leaders decision is final where the safety of the group or any member is in jeopardy; for example where retreat or diversion is necessary due to illness or bad weather. The minimum number of customers we need to run this expedition is three. The maximum size of the expedition will be four customers plus leader. 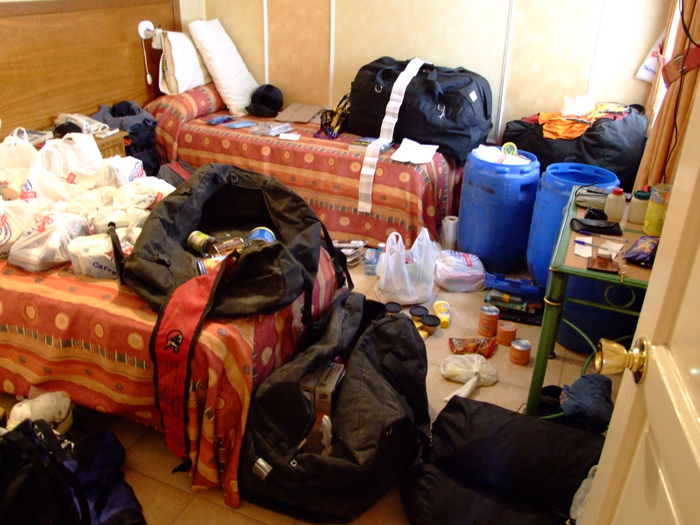 Hotel chaos in the leaders room just before leaving for Ojos del Salado, "ANDES" expedition 2016. Our price is for leadership/guiding and mountain services only. It INCLUDES the leaders fee (wages) and all their expenses, such as flights, travel, hotels, meals, permits. It also INCLUDES his or her share of communal expenses, which may be such things as 4x4 rentals, diesel and fuel, mule and porter costs, shared hotel rooms. Our price also INCLUDES all mountain services such as provision of tents, stoves and all other communal camping equipment, all mountain food including all camp food and lunches on day trips. It also INCLUDES any communal mountaineering equipment that may be necessary, such as ropes, karabiners, etc., and on most expeditions emergency use of satellite telephone link. Our price does NOT INCLUDE - your flights, your insurance, your hotel/hostel accommodation, your meals taken at cafes and restaurants, your share of communal travel costs (e.g 4x4 rental, mule costs), your personal climbing and camping equipment (i.e. used by you alone, such as sleeping bag, harness, helmet), permits or peak fees payable by yourself. All clients must be insured for medical costs and repatriation in an emergency. We recommend having insurance for baggage, personal liability and cancellation as well. If you would like advice on insurance please ask. Please bring an extra copy of your insurance certificate on the expedition for the leader. Chile is one of the most well developed countries in South America. Vaccinations for tetanus, typhoid and polio are recommended. The country is very safe and relaxing to travel in; theft and muggings are as unlikely as they are in most British cities. This is an adventurous mountain trip and all clients will be exposed to an element of risk by taking part in this itinerary. While we take all reasonable precautions to reduce risk it is neither possible nor desirable to completely eliminate these additional risks. Some of these hazards carry the risk of serious injury or death. It is important that you understand the risks involved before signing our booking form. We have identified the following areas as the principal additional risks of this itinerary. This is not a fully inclusive list - please ask if you would like to see a more detailed risk assessment of this itinerary before booking. Driving, hotels and general safety : In Chile driving, fire standards and general safety standards are not as high as in Europe. Extreme remoteness : You will be camping in a very remote area for an extended period and therefore obtaining medical assistance for any problem will be a slow process, likely to take a day or more. There is almost no chance of a helicopter rescue. Minor slips and falls : due to steep, uneven and unstable ground. Weather : The Puna de Atacama is occasionally affected by severe and sometimes dangerous storms and frequent high winds. Forecasts are not so reliable. Altitude : At high altitudes there is an increased risk of medical problems, most obviously altitude illness. Mountain Hazards : In certain places, particularly high on Ojos del Salado you may be subjected to a slight risk of rock fall. 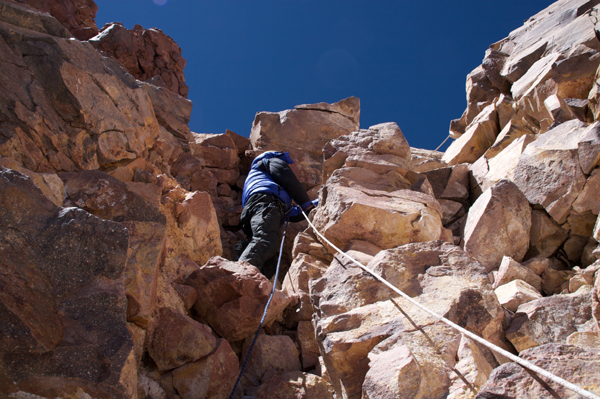 There are risks from a climbing fall on the short section of climbing high on Ojos del Salado. Condors are frequently seen in the Puna, this photo of a juvenile (but still huge!) bird was taken on the acclimatisation phase in the Chaschuil valley during our 2005 Ojos del Salado expedition. 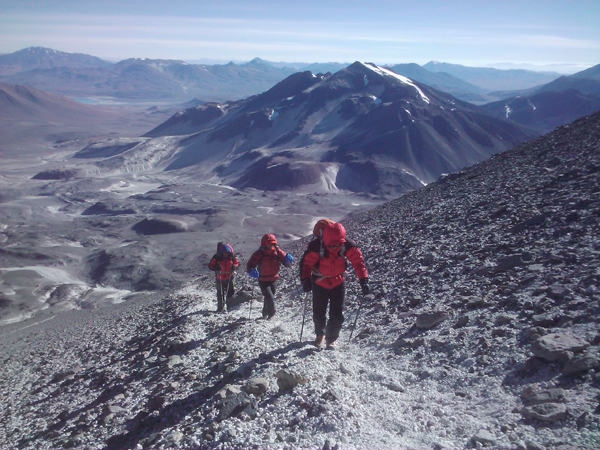 On the way up Ojos del Salado at about 6600m, 2011 expedition. The peak in the background is El Muerto.